Charles Cummings was born in Boston, MA. He is a graduate of Dartmouth College and subsequently at the University of Virginia School of Medicine. Following service in the United States Air Force, he completed residency training in Otolaryngology-Head and Neck Surgery at Harvard Medical School of Massachusetts Eye and Ear Infirmary. 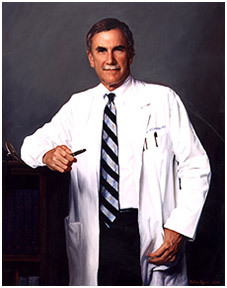 Dr. Cummings has served as Chairman of the Department of Otolaryngology-Head and Neck Surgery at the University of Washington (Seattle) 1978-1990. He became Director of the Department of Otolaryngology-Head and Neck Surgery at Johns Hopkins in 1990. He stepped down in 2003 as Director and has continued as Distinguished Service Professor at Johns Hopkins. Dr. Cummings has written over 125 scientific manuscripts and is the senior editor for the 4-volume textbook, “Cummings Otolaryngology-Head and Neck Surgery”. Dr. Cummings has served as Director of the American Board of Otolaryngology and as Chairman of the Residency Review Committee in Otolaryngology. He is Past President of the American Association for Academic Departments of Otolaryngology, the American Bronchoesophagological Association, as well as the American Academy of Otolaryngology-Head and Neck Surgery.